KidsEBookBestsellers.com: Barry Lyga Took The #1 Nook Teen Spot! Back on March 9th, the top book in the Teen section of the Barnes and Noble Nook store was I Hunt Killers by Barry Lyga. And when I read the blurb, I immediately understood why. It was unusual and compelling, and even though I'm not a fan of thrillers, it made me want to read the book! 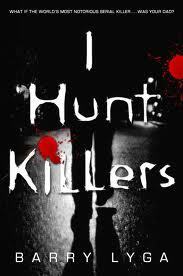 Plus I Hunt Killers has been a New York Times Bestseller. It's super to have Barry join us to talk about his e-pub success. Let's start by hearing that interesting blurb. What if the world's most notorious serial killer…was your father? In short, that's the premise of I HUNT KILLERS. Jasper "Jazz" Dent is the son of Billy Dent, the worst serial killer known to man. Dear Old Dad has been in prison for four years now, and Jazz is just trying to get on with his life. But then bodies start showing up in his small hometown. And if people don't suspect Jazz already, well, they will soon. Now he's got to catch a killer in order to prove to the world that he isn't one. The novel's sequel, titled GAME, was just launched yesterday (4/16) and is available in print and ebook form from all the usual sources, including local bookstores, Amazon, BN.com, and Indiebound. Traditional from the start. My first book -- THE ASTONISHING ADVENTURES OF FANBOY & GOTH GIRL -- was published seven years ago by Houghton Mifflin. Since then, I've also published books with Marvel Comics, Scholastic, and Little Brown. What were your initial thoughts about e-publishing? Were you hesitant? Excited? Apprehensive? Optimistic? Fill in the blank? Honestly, e-books are just another format. I don't get any more excited or anxious or "fill in the blank" about a book in e-form than I do about a book being in paperback. It's all the same words. It's still the same story. Only the delivery mechanism changes. I'm not interested in dictating to people how they should or shouldn't read my books -- if they want to read on a screen, good for them! No, I don't. I think that at some point, there will be a tipping over and there will be more ebooks than not, but there will always be print books. Just as TV didn't kill radio or movies, so, too, can there be multiple ways of enjoying a story. There are advantages and disadvantages to each format, print and ebook. Depending on each individual's experiences and tolerances, one or the other will be more favored, and the publishing industry will provide options for both. It makes sense that a generation that has grown up with iPads practically glued to their hands will be used to consuming media on a screen, so I think that the children's market will benefit from e-publishing as those kids grow up and begin to spend their own money on gadgets and content. It's a little tougher to justify spending a hundred bucks on a piece of electronics that a young child might break, so right now I think e-readers tend to be shared with kids. But when kids get into their teens and young adulthood, they'll start to accumulate their own "toys" and they'll probably be reading on them, since that's what they'll be used to. This generation is a mobile one; the generations to follow will be even more so. It's easier to be mobile with a library in your pocket than it is with an actual library! You'll also find Barry on Twitter. Stop back on Saturday for the latest Kids' EBook Bestseller List and an interview with Ridley Pearson.